In 2016, the IBEW organized several DIRECTV workplaces across the country. We were successful in negotiating one contract which applied to the DIRECTV Technicians and one which applied to all the call center workers. Earlier this year, a training session was between our Telecommunications and Education departments in Salt Lake City, UT. The purposes of the training were to ensure that we have consistency between the stewards, increase the knowledge of our stewards and make sure all DIRECTV stewards were on the same page. The feedback we’ve gotten so far has been overwhelming positive and can only assist our efforts to new increase DIRECT stewards’ solidarity and understand of the intent of the bargaining-for contract language since our new contract will be bargained next year. New AS degree available in Cyber Security Technology. Click the link below to view details. When Alexander Graham Bell received the first ever telephone patent in 1876 he probably did not recognize the dynamic industry he was helping to create. In fact, the telecommunications industry has proven to be one of the most challenging and evolutionary industries in the United States and the IBEW is proud to say that we have played a vital role in helping to make this industry a success since as early as 1897. The Telecommunications Department oversees contracts covering 100,000 highly skilled and sought after IBEW workers employed by the nation’s telecommunications industry. Our members have helped implement the ever-changing technology that is currently deployed by the telephone companies, cable television industry and wireless enterprises. They install, maintain and repair the switches, multiplexors, transmission equipment and associated emergency generating equipment required to keep the communications network viable. The new age of communications and entertainment is having a profound affect on every aspect of our lives, and only with the expertise of IBEW members can the technology thrive. The IBEW represents thousands of customer service representatives and operator services employees throughout the industry. These IBEW members experience a great sense of accomplishment working with the sophisticated equipment that links these various communication formats, while enjoying the protection and advantages contained in several hundred collective bargaining agreements. 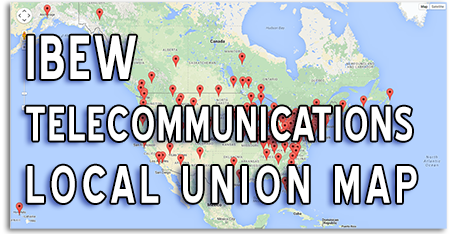 The IBEW Telecommunications Department also provides local unions assistance with national negotiations, local union negotiations, legislation, health care initiatives, training, research and organizing. IBEW members can be confident that as this industry continues to evolve, the brotherhood will be there in force to ensure that our members are there meeting the challenges of the future. We are pleased to announce that a first agreement has been reached between IBEW, Local 676 and Frontier Communications of Alabama. This first agreement was reached 11 months after the employees voted to become represented by the IBEW. The NLRB has issued an award in the DirectSat v. IBEW 21 case ruling in the Union’s favor. The award requires DirectSat to supply the Union will a “full, unredacted” copy of its contract with DirecTV (referred to as a “Home Service Provider” agreement). The Board said that because DirectSat made a proposal which referenced this Home Service Provider agreement, the Union was clearly entitled to it. In the attached unpublished NLRB ruling (Bronx Lobster v. Machinists), the Board overturned the majority vote of employees of Bronx Lobster who voted 14 to 12 to unionize. The rationale for setting aside the vote was that there was a 7 minute delay in opening the polls. There were 4 employees in the unit who didn’t vote. The Board ruled that even though there was absolutely no evidence that the delay caused any of these 4 not to vote, it still had the “potential” to “disenfranchise” these 4 employees. The Board used this to justify ruling against the union since had those 4 employees voted against the union, the employer would have prevailed. Interestingly, the Board Agent running the election was the one who caused the 7 minute delay. The Denver Musicians’ Association has a contract with the Colorado Symphony that allows individual musicians to negotiate a wage rate above the rates in the CBA. After an unsuccessful attempt to negotiate a higher wage with the employer, one of the musicians filed a complaint with the Union because she believed the employer’s offer was unfair and was less than wages being paid to other male musicians. The Union requested a copy of all “overscale” contracts from the employer. The employer refused on the basis that the Union waived its right to information because it agreed to allow individual employees to negotiate their own wages. The Board ruled that a waiver of any bargaining rights by the Union (which includes the right to information) must be “clear and unmistakable” and cannot be inferred because the Union waived its right to bargain “overscale” wages.